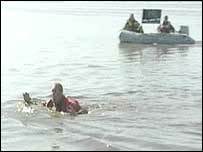 A man has waded across the River Humber for what is believed to be the first time in more than 1,000 years. Graham Boanas, 42, took nearly four hours to make his way through dangerous shipping channels, waist-deep mud and tidal currents to finish the crossing. Mr Boanas, who is 6ft 9ins tall, had only his head and shoulders above the murky waters as he fought to cross the most treacherous part of the river. He has raised more than £20,000 which will go to the charity DebRA. Mr Boanas said: "It is the most tiring thing I have done but it was worth it." After spending months working with experts to calculate split second timings for each section of the mile-wide crossing, he said there were only a few minutes when the tidal currents would allow him to cross the main channel. This was after he had had to crawl spread-eagled and almost face down to negotiate 3ft deep mud banks. Hundreds of supporters were waiting to cheer him on as he strode ashore triumphant near the village of Whitton, in North Lincolnshire. "The final walk up the sand was very difficult but all these people were waiting for me," he said. "It was fantastic. "I was covered in mud and wearing a survival suit but it didn't stop people running up and congratulating me and even giving me money. Mr Boanas said he decided to support DebRA UK after seeing a television report about epidermolysis bullosa (EB), an incurable condition which causes sufferers' skin to blister with the slightest friction. "I am as fit as I have ever been and it was absolutely exhausting," he said. "It was incredible how drained I was as I walked across that last bit of sand. "I was just thinking about my family and the children who I was raising money for." There are reports of the Romans fording the River Humber, but Mr Boanas said there are no records of anybody successfully completing the crossing in recent times.